Because we all want to look like we’ve bathed in glitter, right? Sometimes though, I want my skin to look all polished and sheeny and perfect but not shiny because there’s a fine line between ethereal and sickly. It’s all about enhancing the skin’s natural glow, rather than embracing the oiliness, if you know what I mean. I find it best to start as you mean to go on, and go all out with the sheen before you’ve even really begun. I can’t even apply foundation without applying an illuminating primer anymore. I refuse! Still crushing on the becca backlight primer filter because it just does such a good job at adding a really flattering, diffused light to the face. We’re onto a winner here. Then, my glowy base of choice, the MAC mineralize moisture foundation which everyone with dry skin needs right now. Ever get those dry patches with foundation? Not with this one. For extra sheeny skin points, apply this with a damp beauty blender. Oh boy. To err on the side of sheeny, make sure to powder your tzone because a shiny nose is never cute. Sorry. I’ve dug out my old favourite, theBalm Mary Lou Manizer, which really does give the most incredible amount of light to the face, and it adds some much-needed glimmer to the complexion. Used on tops of the cheeks, under the brows, over the brows, ever so slightly down the centre of the nose… it really does inject some sheen wherever you apply it. I like to use a fan brush, because I find that diffuses the colour in the most aesthetically pleasing way, and a densely bristled brush packs on too much, and then crosses the fine line between sheeny and greasy. Nope. When I think of sheen, I think of skin. That’s not the end of the whole thing though, oh no. 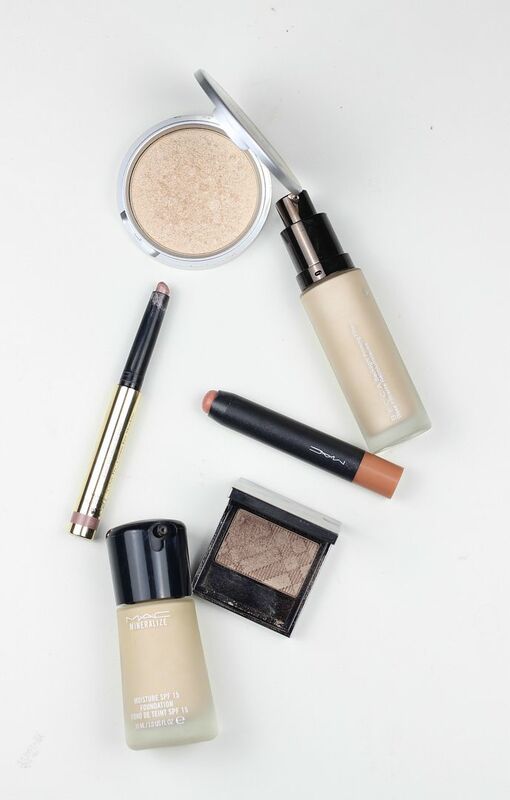 A gorgeous shimmery shadow on the lid perfectly complements illuminated skin, and I can think of nothing better than the Burberry shadow in Pale Barley when worn with the By terry Ombre Blackstar in frozen quartz as a base. Two quick and easy steps that really manage to illuminate the eyes. Lips wise, embracing the sheen makes this one of the few times where I don’t favour a matte lip. I know! It does happen sometimes. I have actually really been enjoying the MAC patentpolish lip pencil from Boxing day, although I see they have a lot of other shades which I think would suit anyone. If you liked this post, you might like this post about strobing, or this post about feeling fresh. 3 blushes to perk you up.